You could make the case that Mark Conroy’s career began in second grade when he started playing organized football. Throughout his school days, he played the game, captaining his team at Middlebury College, where he earned All East honors and a nod as Honorable Mention All American. 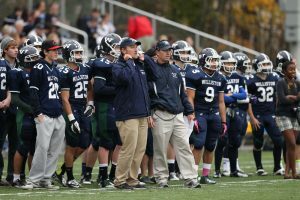 Conroy has spent 33 years coaching (mostly football but also basketball and baseball) at boarding schools, 30 of those serving in the Athletic Director role, as he has at Williston for the last 18 years. He stepped down as football coach at the end of the 2015-16 school year, continuing on as AD. 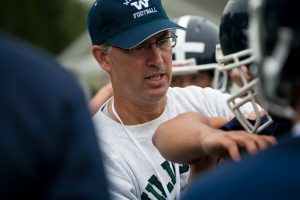 As a fitting tribute to a career devoted to inspiring excellence and modeling leadership for young people, Conroy has been elected to the NEPSFCA Coaches’ Hall of Fame. As a result, one of the seven NEPSAC championship football bowl games, which are named for hall of fame inductees, will be named the Mark Conroy Bowl. That commitment to mentoring youth is evident to all who work with Conroy, including those who played football for him.